From Cabin to Castle, large estates and mineral rights are our specialty. We appraise rural, commercial farm, and estate property in Arkansas and Oklahoma. We provide reports for legal and tax consultants, estates, and others in narrative format to USPAP standards. To properly do an oil and gas appraisal, the appraiser function is usually best separated from the estimating function. The estimating function sets up the parameters or forecast of the income stream by estimating the remaining reserves, known as the “decline curve”. That function is usually performed by a qualified reservoir engineer or geologist experienced in estimating probable production. 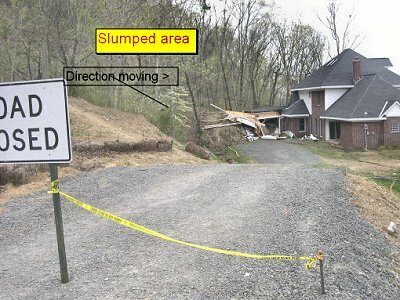 A pre-purchase inspection of property for geological hazards serves to protect the unwary buyer from disaster. Steep slopes, rock falls, poor soils, flood zones, earthquake risk and other geological problems cost property owners millions annually. Developers risk l<? include (‘../feeds/newsfeeds/zfeeder.php’); ?>osing their investment. People’s lives can be at risk. Because of our construction materials and real estate background, we can do geological investigations to help protect you from disasters. This picture of a landslide near Heber Springs, Arkansas where we were engaged to conduct a survey of the cause of the disaster. Having problems correlating your well? Are your mudloggers unfamiliar with the Arkoma Basin? I have 20 years experience in the basin as well as experience in the Mississippian Embayment at the extreme edges of the Fayetteville Shale Play. I have examined well samples from over 20 wells in Woodruff, Lee, Cross, Crittenden, and White Counties as well as numerous wells and logs from Faulkner, Conway, Van Buren, and Pope County. 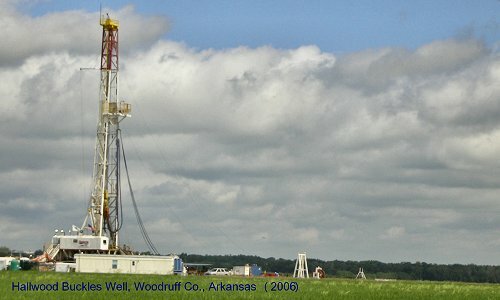 I also have experience with both mud and air-drilled shallow wells in E. Oklahoma and Arkansas. We have scope, will travel. Expertise and experience in SW Colorado, E & W Texas, and all of Oklahoma.